Last night, 15th October 2009, the Dublin branch of Ireland Palestine Solidarity Campaign held it's first discussion evening of the season. 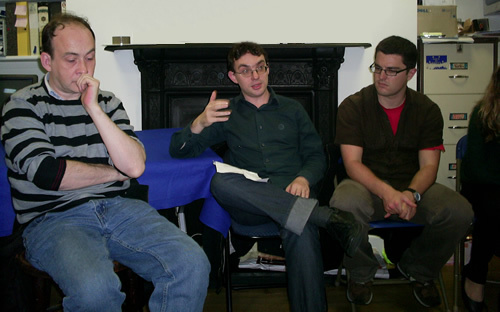 The discussion, which took place in Connolly Books, was led by David Landy a long standing activist with the IPSC and lecturer in Trinity College Dublin and chaired by Diarmuid Breatnach, an activist with the IPSC in Dublin. The talk concerned the role of the Israeli left and peace groups and the relationship of Solidarity Organisations to them. The bravery of those few Israelis who stand up to their government was recognised, while at the same time David Landy pointed out that “with the collapse of the ‘official’ peace movement, only the radical movement is left” and that “we are only, unfortunately talking about a few Israelis – a very small, Ashkenazi (European Jewish), middle class group of people that has no effect whatsoever on Israeli policy, and are considered far far-left by the general population”. The talk also focused on the notion of the Israeli peace groups serving as “gatekeepers of resistance”. This was seen in the case of the recent Leonard Cohen concert in Israel, where some Israeli ‘reconciliation’ groups tried to scupper international and Palestinian attempts to get Leonard Cohen not to perform his concert in Israel. In the discussion that followed David's presentation, Kevin Squires of the IPSC pointed out that when we talk abut linking up with Israeli peace activists, we tend to exclude the 1.2m Palestinian citizens of Israel, and we should seriously think about linking with their groups and parties such as Hadash, the only party that tries to be properly bi-communal. He also pointed to the severe repression faced by these groups – especially during the assault on Gaza - and commented that this stood in stark contrast to the oft-repeated phrase that Israel is “the only democracy in the Middle East”. The IPSC would like to thank everyone who attended. The next discussion evening will be held in Connolly Books, Essex Street, Dublin 2 on Thursday 26th November 2009 and will be led by Anaheed Al-Hardan, a PhD candidate in Trinity College Dublin. To find out more about the IPSC or to become a member see http://www.ipsc.ie, email info@ipsc.ie or call 01 6770253. In a special session Friday, 25 of the Human Rights Council's members voted in favor of the resolution that chastised Israel for failing to cooperate with the UN mission led by Goldstone. Another six voted against and 11 abstained. U.S., Italy, Holland, Hungary, Slovakia and Ukraine. Mauritius, Nicaragua and Nigeria voted in favor of the report. Bosnia, Burkina-Faso, Cameron, Gabon, Japan, Mexico, Norway, Belgium, South Korea, Slovenia and Uruguay. Madagascar and Kyrgyzstan were not present during the vote. "This resolution goes far beyond even the initial scope of the Goldstone report into a discussion of elements that should be resolved in the context of permanent status negotiations between the Palestinians and the Israelis," U.S. envoy to the UN Douglas Griffiths said, when explaining why his country was voting against the document. And does the fact that a state is democratic prohibit it from taking any reasonable action whatsoever to curb the activities of groups who try to undermine its existence by unconstitutional means? Where do you start with the oppression against Palestinians living in Israel? With Susan Nathan's book 'The Other Side of Israel' which documents in journalistic style the everyday oppressions of Palestinians. Maybe with Jonathan Cook's reports? www.jkcook.net/ Or with the grim litany of articles outlining a history of oppression that you can read in the PIWP database on Palestinian citizens of Israel: http://cosmos.ucc.ie/cs1064/jabowen/IPSC/php/db.php?tid=14 . If you wanted to find out, you really could. Read at least some of this stuff Eamonn, and then get back to us. And yes, Palestinian Israeli parties have been banned. Any party that is seen to oppose the Jewish nature of the State of Israel, by say, calling for a state of all its citizens is considered to be illegal. And yes, Palestinian Israeli parliamentarians have been stopped from taking their seats. One, Azmi Bishara, the head of the major Palestinian Israeli party, was accused of treason, and to avoid being banged up in jail had to flee the country. Israel is undoubtedly a democracy for those of the right ethnic background, just like South Africa was. For the majority of people under its control, whether in the Occupied Territories or Israel itself, it's just another apartheid country. Amused by the 'not one stable country' comment . Partly because it was completely unrelated and was just random Zionist trolling. Partly because of the code - what the author really meant was not one 'white' country. Countries like India, South Africa, Argentina, Ghana, and Brazil voting for the report clearly don't count. or dictators who murder their opponents ? And has he read Goldtsone's latest retraction ? Israel violated human rights. Time to stop ignoring this. Trying to understand Sean Og, but failing. Firstly, why put an article about Goldstone here? Secondly, more importantly, why is he singling out Israel!!! Is anyone seriously denying that Israel killed 1,300 people, most civilians, many kids, while attacking a built-up area earlier this year? Of course there’d be a UN HR report on this. And of course it would condemn the mass slaughter. Seriously, did anyone expect otherwise? Such reports are regularly produced and (unfortunately) even more regularly ignored. But would there be any other country where the report, the countries voting for the report, the character of the person who wrote the report (a Jewish Zionist ironically) would be attacked so manically? All these people singling out Israel. All so that the essential information – Israel committed mass slaughter and will do so again if it isn’t stopped – can be ignored. Anyway, I’ll stop feeding the trolls. I guess though I’ll advise Sean Og to take his own advice and take up a new hobby. There must be many other states slaughtering people who would love his services. Myself though, I’ll stick to defending human rights in Israel/Palestine.